The following are copies of various documents, including extracts from original music that would have been performed with various films. The files are in PDF format and can be viewed or downloaded. Images and articles on this site are free to use, but please acknowledge their use, and this website, in any re-publication. 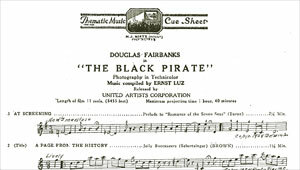 The Black Pirate starred Douglas Fairbanks and had the distinction of being in Technicolor. Although there were earlier Technicolor films, this picture, directed by Albert Parker, was released in 1926 and was the first colour film to be widely distributed. Please click on the image to view this document as a PDF. 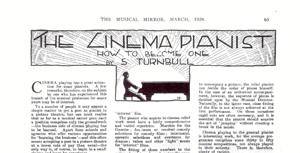 A quite extraordinarily dismissive article from the Musical Mirror in which playing for films is described in detail by 'one who knows' with a caveat in the final paragraph which amounts to saying 'if you're any good as a pianist don't touch cinema playing with a bargepole'. This is the only surviving full score for a British silent fiction film in existence, and as such is a treasure trove of information about both playing and synchronising the score to the film. It is too big to explore in its entirety but have a look at the available pages in the pdf and you will see marked descriptions of musical passages (this is a piano-conductor score so doesn't contain all the orchestration) and on-screen cues to keep the music synchronised. My excellent colleague Philip Carli has restored this score and arranged some of the missing instruments and it is hoped, one day, that the whole score will be heard complete for the first time since 1930! You may also be interested in my article on the score 'Distant trumpets - the score to "The Flag Lieutenant" and music of the British silent cinema' in the collection 'Young and Innocent? The Cinema in Britain 1896-1930'. 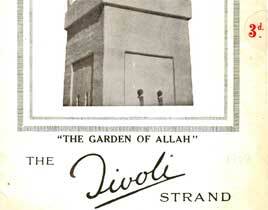 Here is another fascinating document, the programme from the Tivoli Cinema in the Strand (now, sadly, vanished) for Rex Ingrams's hugely successful 'Garden of Allah' - check out particularly the orchestral delights which form part of the evening's entertainment, and the advert for an 'Orchestral Organ' - the organ was often a financially efficient replacement for players in an orchestra and it is one of the ironies of the coming of sound that the organ was the sole-surviving remnant of live music in cinemas after sound came in. These are cue sheets for two other films for which prints survive, Hell's Heroes, a very late silent Western directed by Hollywood legend William Wyler (who would later direct Ben Hur, amongst many other classics). The Hound of the Baskervilles, which needs no introduction. 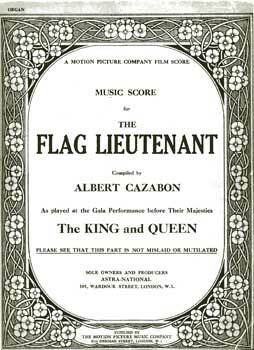 Pages from the Bioscope written by the arranger of the Flag Lieutenant, Albert Cazabon. 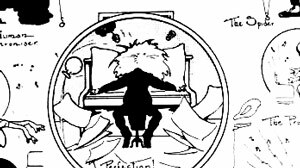 Cazabon was one of the most distinguished theatre and cinema musical directors of the 1920s and here he addresses himself to the problems of the cinema conductor, particularly the new electrical technology which allowed the conductor to control the speed at which the film was shown and the problems of music that over-emphasises dramatic emotion. 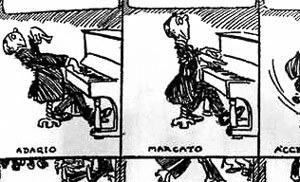 So much for the old canard that all silent movie music was over-emotional. 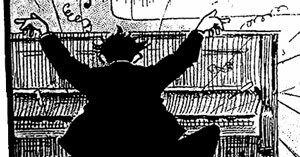 'I Want to See This Annie Mattygraph : A Cartoon History of the Coming of the Movies'. 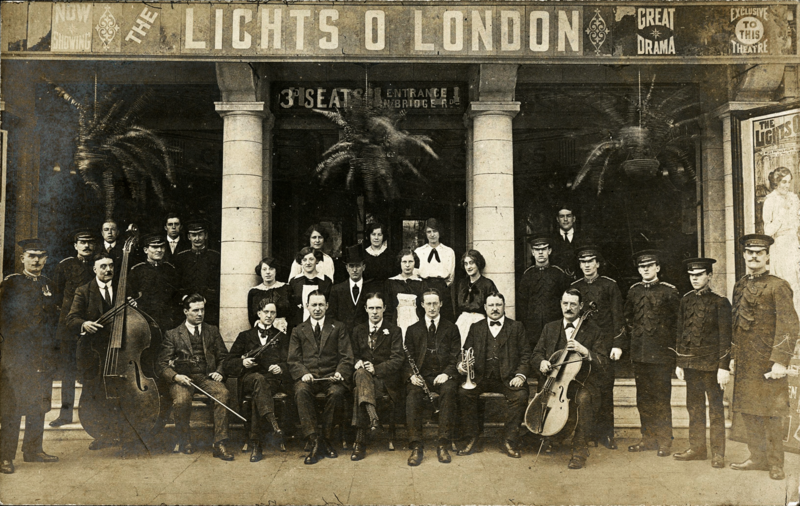 A very rare 1914 photograph of a cinema's full personnel, with the band across the centre - pianist with buttonhole, percussion next to him, extraordinarily dodgy wig on the bass player. With huge thanks to Dr Nicholas Hiley for access to another gem from his collection.